School construction is at a zenith in Northwest Indiana. Between expansion, renovation, and replacement, school construction projects are doing more than their share to keep the economy moving. Why? According to the state education department statistics, 23 percent of the state’s population is in a K-12 school. Indiana is ranked as the 15th state regarding enrollment, and the 16th state in the number of schools. The Hoosier state is closing in on the 2,000-school mark. CORE Construction is the Construction Manager as Constructor (CMc) for the new Illiana Christian school project in Dyer, just over the Illinois state line. 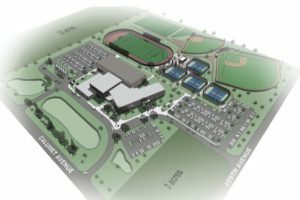 It’s a $21.7 million project that will build a 104,000-square foot Christian high school and is scheduled to be completed fall of 2018. CORE Construction is the Construction Manager as Constructor (CMc) for the new Illiana Christian school going up in Dyer. The location is very close to the Indiana/Illinois state line, an attempt to keep current Illinois students coming to the new school. It’s a $21.7 million project that will build a 104,000-square foot Christian high school. 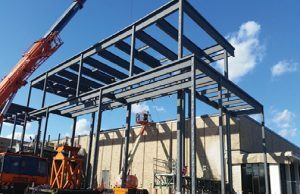 The state legislation passed a bill in July 2017 that allows a company to act as CMc for public school construction. The process provides control over the construction by having direct contact with the subcontractors that were awarded bids. They also provide a guaranteed maximum price (GMP), which gives the client a firm cost estimate. That’s especially important where tax dollars and/or donations come into play. Beer believes the CMc process minimizes change orders and overruns. They are still options that can be negotiated, depending on the need and the budget. By managing the subcontractors, the CMc becomes an agent to keep the project on time and on budget. The Illiana project has a completion date of fall 2018. AJ Turkstra, the assistant principal, says that the project has proceeded very well to date. The age of the existing school, and the absence of land to expand upon, forced the Illiana Christian school board to make the decision to build new. Core is the 4th largest school builder in the country. Now that the CMc process has been approved in Indiana, they are expanding their presence on projects here. In addition to Illiana Christian, they are negotiating with a public school in Northwest Indiana to lead a project that will build a bus barn and maintenance building. The city of Valparaiso passed a $148 million referendum in 2015 to raise funds for a massive school project. 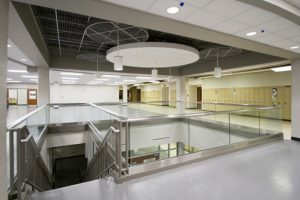 The referendum includes major upgrades and additions to the high school and seven elementary schools. “There’s a lot of upfront work to determine the best course of action for a particular school,” says Scott Cherry, senior vice president, Skillman Corporation. The city of Valparaiso passed a $148 million referendum in 2015 to raise funds for a massive school project. The referendum is funding a new 550-student elementary school south of U.S. 30, along with major upgrades and additions to the high school and seven elementary schools. Skillman Corporation is the construction project manager for the Valparaiso undertaking. Scott Cherry, the senior vice president, is the account executive for the overall project. A project manager supervises the work at each school, he explains, handling the interaction with subcontractors who perform the construction. Skillman worked with the school corporation to determine which schools could be renovated, renovated with additions, or replaced. ADA requirements, square footage guidelines, environmental issues such as asbestos, new IT requirements, security, and the efficiency of current systems all go into the analysis. At Lowell, the $7 million project revolves around a new Advanced Manufacturing Trades (ATM) building. The building will be used for vocational classes for students who have an interest in manufacturing, skilled labor, and computer numerical control operations. Derek Anderson, Skillman’s onsite project manager, says all exterior lighting fixture heads will be replaced with LED lighting with an estimated $10K rebate from NIPSCO expected for the transition. The piping in the building will be exposed and color-coded according to its function; distinct colors for plumbing, electrical, heating and air condition, so students will easily distinguish among them. That will tie into the industrial-type training offered. Larson-Danielson is building a new performing arts center at La Porte High that replaces the outdated auditorium. While new methodologies in construction and project management stand at the forefront, there remains plenty of room for school projects that are designed and supervised by generations who have lived in the area they service. In several cases, they attended the school where they now preside over renovations and additions. David Merkel is a project engineer and manager for Larson Danielson Construction. Headquartered in La Porte, the 110-year-old company is a design-build commercial general contractor. Their services include construction management, pre-construction planning, and skilled labor in all commercial construction trades. They are currently managing the $86 million project to renovate/add-on at La Porte High School, build the new elementary school called Hanley, and add La Porte Intermediate School on to the existing Kessling Middle School. Brian Larson is the project manager for the high school’s performing arts center. Kevin Spence is the project manager for the new elementary school. And Merkel is the PM for the intermediate school. In each case, the managers either attended that school or another one in the same community. The intermediate school will house students in grades 7-8, while the middle school will educate grades 5-6. The large land tract at Kessling will allow the schools to expand by 162,000 square feet. At the high school, Larson-Danielson will build a new performing arts center that replaces the outdated auditorium. The new elementary school will house students K-4, which is a growing segment in La Porte. While construction moves along at a brisk pace on the projects detailed above, more school renovations and additions are on the horizon for 2018 and beyond. The school cities of Hobart and Hammond both passed their referendum questions on the November 7, 2017 ballots. Both school districts are now moving forward with building new schools, renovating existing ones, and maintaining their teaching staff. Hammond, with close to 14,000 students, asked voters for the authority to borrow $110.6 million for the construction of a new high school and upgrades to existing buildings, along with $70 million for operational costs. The new high school will be built behind the current one. The district has suffered a reduction in funding from the state, state-mandated tax caps, increased costs for health care and continued increases in energy and fuel costs. According to the school district, the state has reduced its revenue by $5.7 million in the past two years. The district currently spends a total of nearly $127.9 million annually on student instruction and other daily operating expenses. The Hobart referendum approved the school corporation to borrow $41.2 million for construction. The money will be used to build a new elementary school, a swimming pool at the high school and upgrades at other schools. The new school would be built on Wisconsin Street at the site of the former Mundell Elementary. The operating referendum will allow the district to raise $2 million a year for six years beginning in 2020. That money will not raise local taxes and won’t be used to give pay raises. The district wants to generate the additional funds to maintain its operations budget for student instruction, transportation and other regular considerations, which total $42.3 million this year. There will be no tax rate increase in the school’s debt service, because the cost of repaying this new construction debt will be more than offset by a refinancing of older high school debt to a lower interest rate and the anticipated tax cap reduction. Bids for these new projects will take place once funds have been secured.